By Jon Tewksbury Posted: January 8, 2019 1:00 p.m. Faculty of Media, Art, and Performance professor Robert Truszkowski has a passion for printmaking. 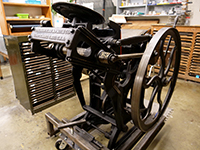 As print master general of the University’s ever-expanding print media studio, he has overseen the growth of the department’s specialized production equipment which now includes a 110-year-old manual letterpress. But along with the resurgence of printmaking and the increasing number of students interested in the craft, so has the cost of art materials grown. 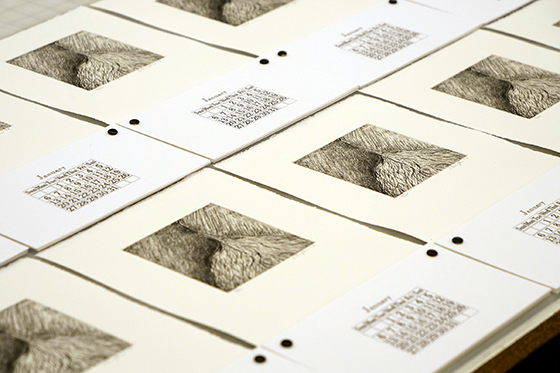 The inaugural fundraising project pairs a unique etching created by long-time visual arts professor Leesa Streifler, widely known for her expressive painting and drawing style, with a manually letterpressed calendar, printed in-house by Truszkowski on the century-old letterpress. Streifler was intrigued with Truszkowski’s Forty Project, and having studied printmaking during her time as a student in Winnipeg, she jumped at the chance to be able to work with printmaking again. Because the press is manual, Truszkowski was even able to take advantage of a province-wide power outage last month. Forty-five calendars were made available for purchase and each quickly sold. Truszkowski hopes to make the Forty Project an annual tradition with a different faculty member creating the calendar artwork each year. Streifler shares an unintended but happy secondary benefit of the project.